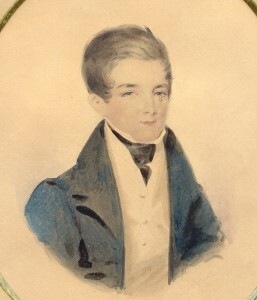 Dr Nicholas Nugent, who designated himself ‘of Antigua’, lived from 1781 to 1843 and was one of the third generation of Nugents to have lived in Antigua after his father, Oliver Nugent (who died in 1802), and his grandfather, Walter Nugent (died 1758). Captain Walter Nugent had first migrated to Antigua from Ireland around 1718, in the aftermath of the Battle of the Boyne. The family had previously owned estates at Drumcree in County Westmeath. Dr Nicholas was a medical doctor with wide scientific interests and is chiefly remembered as a geologist and biologist. On November 5th, 1819, he addressed the Geological Society of London on the subject ‘A Sketch of the Geology of the Island of Antigua’, a fuller version of which was subsequently published in America. He also sent the Geological Society large collections of rocks and fossils, carefully labelled as to their origins. Corals in this collection were later analysed by P. Martin Duncan whose findings appeared in 1863–64. A travelogue by Charles Kingsley, author of ‘The Water Babies’, entitled ‘At Last: A Christmas in the West Indies’ refers to Dr Nugent’s Memoir on the Geology of Antigua (1821) as well as his paper ‘Souffriere of Montserrat’ in the Geological Society’s Transactions vol. I (1811). Dr Nugent graduated in medicine from Edinburgh University, where his son Oliver later studied. In the 1960s a South African etymologist, Clive Moran, contacted my father Oliver, Dr Nicholas’s great great grandson, about a cactus that was sent as a specimen to Edinburgh University in 1824. Later it had been transplanted to South Africa where it was apparently sticking in the jaws of cattle trying to eat it. They were able to work out that it was Dr Nicholas who had sent the cactus to Edinburgh! 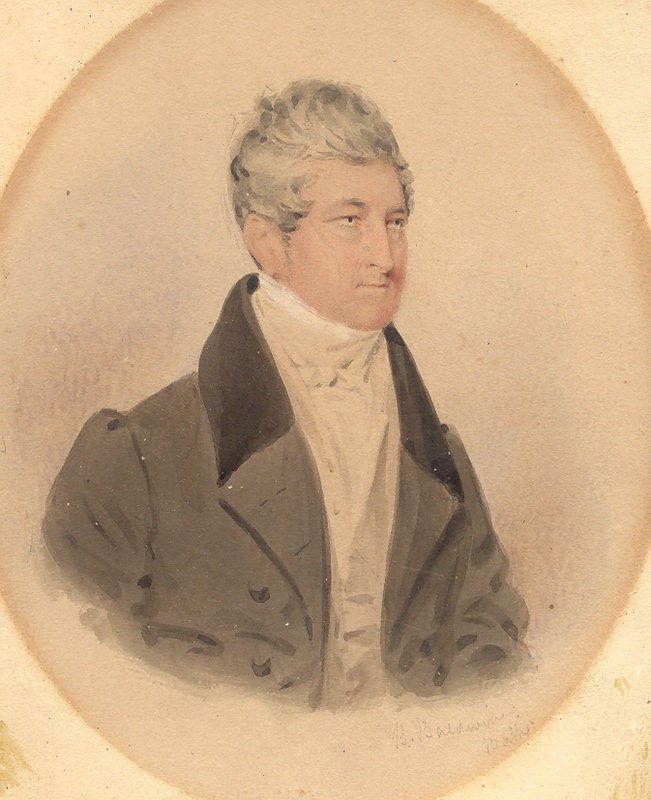 Dr Nicholas was also a landowner and managed the estate of Lyon’s where he resided in the 1830s. The authors of the book Emancipation in the West Indies (1837) wrote that in respect to general intelligence and agricultural knowledge” no man in Antigua stands higher than Dr Nugent”. He is remembered as the prime mover in the abolition of slavery in Antigua, though there was a degree of self interest in the move. In abolishing slavery at one go rather than gradually he and fellow assembly members hoped to be released from an unpopular tax imposed on landowners who had sworn allegiance to France during a brief period of French occupation. They were disappointed when this did not happen, though accounts suggest that the emancipation was peaceful with even former slave owners proclaiming things were much better without slavery. For his services to the island Dr Nicholas was presented with a silver table centrepiece or epergne. He was also presented with a silver dinner service by “inhabitants of Antigua”. Though Antigua takes pride in being one of the first British colonies to abolish slavery, the condition of former slaves improved only slowly. The viability of the colony depended on sugar being produced at a competitive price which in turn depended on cheap labour. 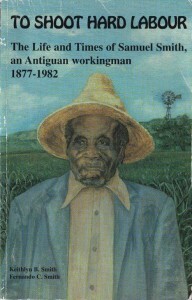 In his memoir of an Antiguan workingman ‘To Shoot Hard Labour’, Samuel Smith tells how working people, black or white, were paid just enough to keep them alive and that nine 9 years after emancipation ‘the wage paid to a black working on contract was less than what it had cost to feed, clothe and shelter a slave’. Working conditions, the book tells us, were virtually the same as for those previously enslaved, and estate owner brutality continued. 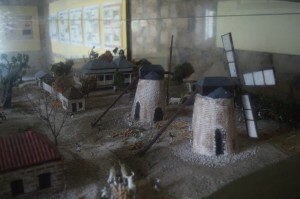 Model of Betty's Hope, one of the largest estates, showing the Great House which no longer stands. Dr Nicholas's Son Sir Oliver lived there. Nor were former slaves given the vote: ‘In 1838, when the population of Antigua was around 36,000 people, only 323 people were allowed to vote’ (pp 21-2). Former slaves lived in communal houses whose roofs often leaked, there was no sanitation to speak of, no soap or disinfectant hence lice and fleas were a problem. Clothing was as hard to come by as meat. Few children of former slaves had the opportunity to attend school (pp 38-44). 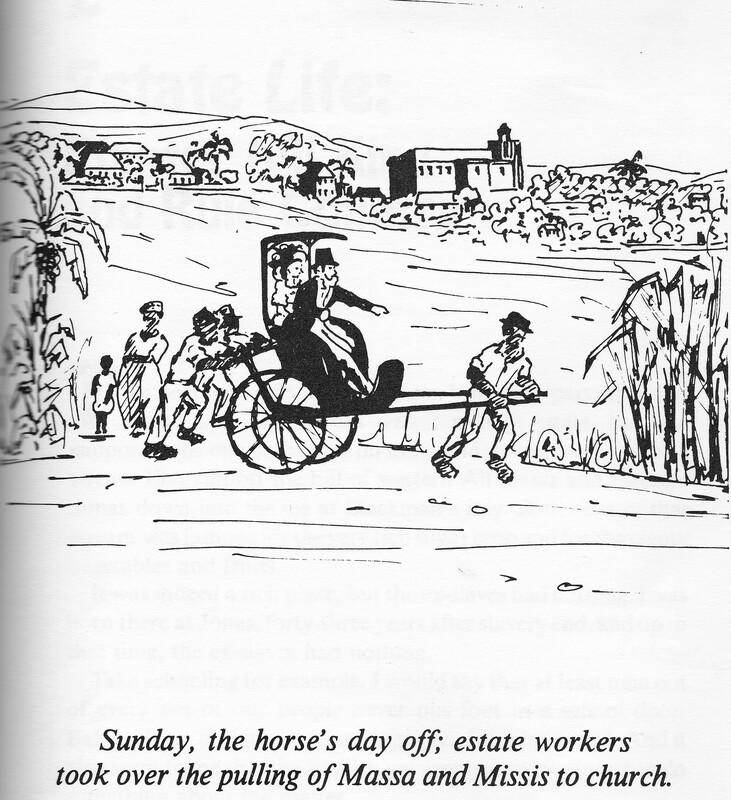 A cartoon from To Shoot Hard Labour tells its own story. What started to make a difference for descendants of former slaves, according to Smith’s account, was the coming in 1904 of Gunthorpes, a centralised sugar refinery, where higher wages were paid. Says Smith: ‘We start to develop skills, people start to see they could learn something, that life isn’t just ploughing fields, digging roots, weeding grass and dropping dung’ (p 128). On the estates things were slower to improve and even a hundred years after emancipation living conditions for workers were hardly better (p 139). Another key stage on the road to full emancipation was the introduction of trade unionism in 1939. An early trade union leader, Vere Bird, became the first Prime Minister of Antigua and Barbuda on independence in 1981. Mechanisation and trade unionism demonstrated what estate owners and managers had been slow to accept: that sugar production was not viable in Antigua once estates started to pay their workers living wages. From that time the sugar industry went into decline. Sugar is no longer grown in Antigua. Dr Nicholas married Eliza Boyce Ledwell, who was born in Edinburgh in 1791. Her sister, Jane Ledwell, had married George Weatherill Ottley of Antigua five years earlier. Nicholas and Eliza lived at Merrywing Hall, Antigua, where they had 13 children including Sir Oliver Nugent, my great great grandfather. Children who died young included Eliza Nugent Ottley, born 1820, died 1823, buried St George’s; Caroline Williams Ottley, b 1824, d 1825 aged one month. Dr Nicholas died in 1843 and is thought to be buried at Highgate cemetery, London. The picture of him (top) is based on a portrait by B Baldwin, who also painted this picture (left) of one of Dr Nicholas’s sons, probably Sir Oliver. Source: Nugent Family tree; Family papers; On emancipation: ‘Emancipation in the West Indies’ by J Thome and H Kimball, New York, 1838; On geology: http://jgslegacy.lyellcollection.org/cgi/content/abstract/57/1-4/490; On cactus: http://www.jstor.org/pss/1219455; Correspondence between Oliver Nugent CBE and Dalmer Dew. 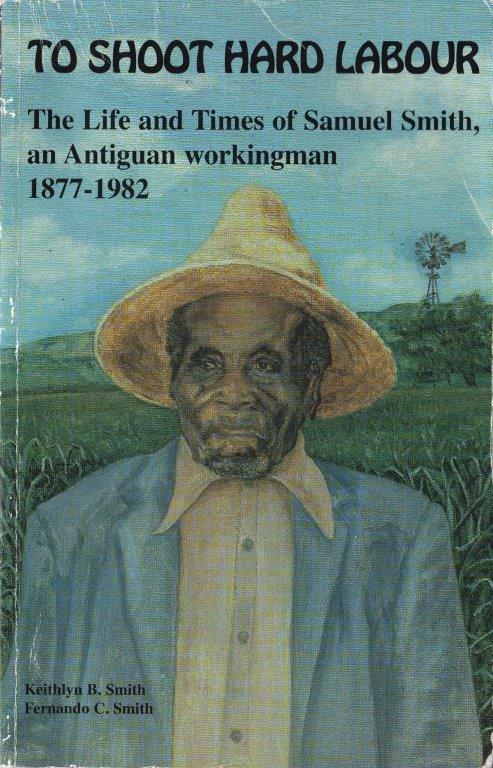 To Shoot Hard Labour: The Life and Times of Samuel Smith, an Antiguan workingman 1877-1982’ is authored by Smith’s grandchildren Keithlyn B Smith and Fernando C Smith and was published in Canada in 1986 by Edan’s Publishers; quotes are from the 1988 edition. The book is also cited on the page Lucretia, Lady Nugent.